In his own words, ‘just when you thought you couldn’t stand another man with a beard singing about his feelings’. 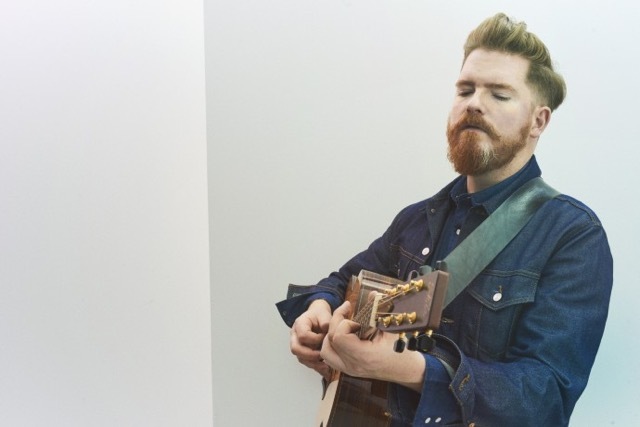 And while he may look like a stereotypical hipster with a ginger beard and designer shirt from TK Maxx, John Smith more than surpasses the standard expectations of a singer-songwriter with an acoustic guitar. The Devonshire musician is touring the UK and Europe this winter after the release of Headlong earlier this spring, his fifth self-released album. Even though this collection of new tunes still features those guitar fingerpicking styles he’s famous for, the extended use of electric guitar made this record stand out. The track ‘Far Too Good’ is distinctive in particular, with a slight bluesy twinge but the focus remains on Smith’s beautifully poetic lyrics. Personally, I liked ‘Undone’, a less heartwarming track perhaps but something is haunting about it, and it’s almost a moment of pause in the middle of an otherwise uplifting album. In a live setting, however, in a trio made up of John, John and Joe, they surpass any of their records. There is something special about a band who come alive when on stage, and their ability to harmonise with one another’s vocal parts while improvising around their material was well done. There was an appreciated ‘no phones’ and ‘no disturbing the audience’ rule, imposed by Smith but absorbed by the audience who seemed to be drawn into the warm atmosphere of the cosy Malt Room at The Brewery Arts Centre in Kendal. The band pleased all, playing new and old songs, with some solo sets from Smith thrown into the mix. In particular, when he played ‘There Is A Stone’ from his previous album Great Lakes (2013), the room went silent, and all focus was on the intricate guitar part and Smith’s powerful yet slightly husky voice. A sense of awe was expressed when a percussive guitar-style solo, ‘Winter’ was performed, a tricky technique which Smith pulled off. I’ll admit I was impressed; few guitarists can master those techniques to that level. I find something admirable in a band who are different each time you see them, who are constantly improving on their material rather than just reciting what they’ve already written. So whilst I’m usually pretty critical of bands in one way or another, the level of professional musicianship, as well as the utter joy seen on their faces when playing together, has my complete praise. A note must be given to the support acts at The Brewery, Dennis Ellsworth and Kinley Dowling. All the way from Canada and supporting the band for some of the UK tour, the two musicians are well suited. Though noticeably less experienced than Mr Smith, their vocal harmonies blended beautifully and their ability to craft narratives into their song lyrics adds to their delightful stage presence. They’re ones to look out for. John Smith has got the talent, an epic band to back him up and a beard other men dream of. They may share the same hair colour, but he’s an example of what Ed Sheeran should be. So, do yourself a favour, and go and listen to some John Smith. Because everyone needs a talented heartfelt hipster that they can listen to on cold winter mornings.